Used to provide a robust thread in moulded/fabricated plastic components where the softness of the substrate precludes a tapped thread. 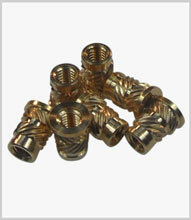 Brass threaded inserts are a favourite for use throughout industry where they can provide a quick thread just by drilling or moulding a pilot hole and pressing the insert into place. Where higher torque resistance is required the application of heat or ultra sonic vibrations may be required. Expansion and self-tapping inserts are also available in brass for use in plastics or in the case of wood, and some composite materials, steel and stainless steel self-tapping inserts can be supplied. Metric as well as imperial thread forms are on offer.